The sentiments were stamped in black on Crumb Cake, Lost Lagoon and Pink Pirouette, then either punched out or diecut with a banner punch and adhered strategically! Finally, some tan baker's twine and a candy dot finished it off! We hope you will play along too! Hmmm....what should I charge for these books? And I wonder where those glasses are?! Such a happy card LeAnne! 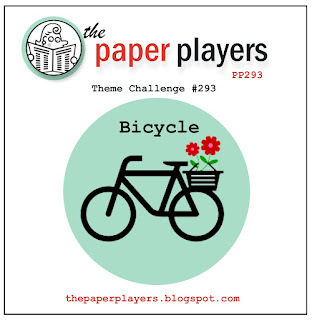 I love that retro flower paper that inspired the colour scheme of today's card and the bicycle stamped over the words looks great. Such a clever use of the various highlighted words too! As for Cassidy - her expression tells me shopping in her store is going to be expensive!! Total sweetness! The bike image is wonderful stamped right on the paper! And yep those glasses could be anywhere! Your card is delightful LeAnne!! I like the butterflies fluttering out of the basket. I remember playing store with my cousin when our families were camping! We made cash registers and groceries from the cut lumber scraps our dad's used for firewood. We used to get so mad at them when they burned our produce every night LOL!! But the toasted marshmallows made up for it!! Love all the details on your card!The butterflies are so cute coming out of the basket,too! LeAnne, I just love the mix of fun retro patterns! Your little butterfly fluttering out of the basket is lovely! All the different sentiments are perfect! Oh, there is so much to love in this card. I always love your collage cards and am so happy you made one for my challenge. The mix of patterned papers is so hip and the colors are fun and fresh. Adore all of it--thanks for making my theme sparkle! The patterned papers are awesome and I love the butterflies hovering over the basket. Such a pretty card!